If Crimea was Russia then, if only a “speck” and no matter how “vicious” the Bolsheviks from the “north” turned out to be, how on earth could Crimea be otherwise now? There is no doubt that Vladimir Nabokov considered Crimea to be Russian after the peninsula was transferred to Ukrainian administration in February 1954. There is also no doubt that Nabokov, like Russians before and after him, selected Montreux, Switzerland, as his home in evocation of the Yalta of his early life (and as a tax haven for his later life). This isn’t the stuff which Schiff, her newspaper, or the Gessen family oligopoly of New York Russian memoirs would tolerate if they had their wits about them. Schiff’s centennial celebration misses Nabokov’s vindictive streak, and the blind obtuseness it gave his public views. In the pages of his fiction, Nabokov could torment a blind man with the noise of the sexual infidelities of his wife; in the fiction market he tried to do the same to those he judged to be his literary rivals. Boris Pasternak, for instance. 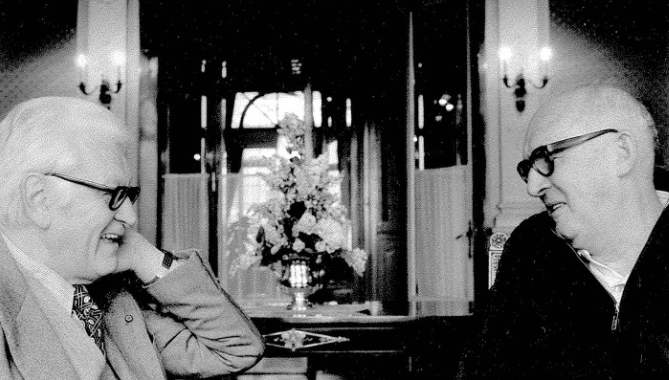 Nicolas Nabokov (left) with Vladimir Nabokov (right). For the role of Nicolas Nabokov played in recruiting cellist Mstislav Rostropovich in Berlin in 1964, read this. Schiff avoids reporting the documentary proof that the Zhivago publication and Nobel Prize were CIA plots; for details, read this. Schiff also avoids mentioning that Nabokov’s cousin Nicolas was one of the CIA’s agents running these propaganda operations at the time. Vladimir Nabokov’s sour grapes were also a calculated lie for American readers. 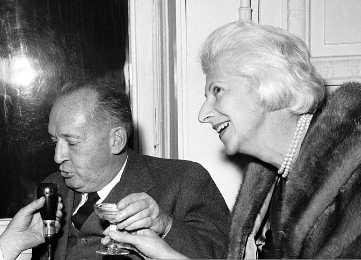 Note: the lead picture is of Vladimir Nabokov and his wife Vera being interviewed by a reporter for French radio in Paris on October 24, 1959. The champagne was not from Crimea. Vladimir died in 1977; Vera in 1991.